While there is always a lot of variety in my whisky cupboard, there are some staples that I always try to make sure are in there. 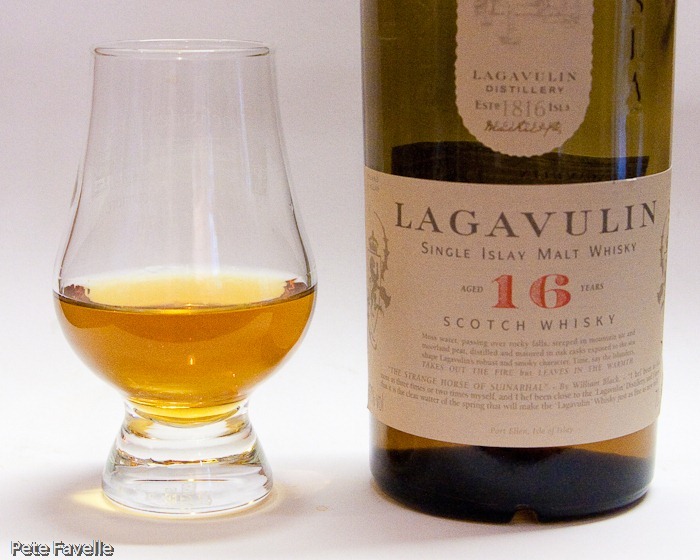 Lagavulin is definitely one of those distilleries that is always represented. As well as being a great Islay distillery, it’s also where my whisky drinking life started so I will always have a soft spot for it. Here we have their 16 Year Old expression – a wonderful, rich golden colour in the glass that just cries out to be enjoyed. The nose is quite light on the smoke, considering it’s an Islay whisky. Sweet, pale honey notes with a distinct whiff of sea spray and enough alcohol to wake up your taste buds without masking everything. Watered, the smoke is much more prominent; the sweetness fades but the sea is still lurking underneath. The Islay character makes itself felt much more in the mouth; smouldering peat on the tip of your tongue, with just a hint of honey putting in an appearance and the fire fades more into smoke. There’s a surprisingly tannic dry finish right at the very end, which just makes you reach for another sip. With water, that initial fire is quelled and the smoke is right there at the front. The balance of honey and smoke is more consistent throughout the drink, and the finish is significantly less dry – overall it’s easier drinking, but has lost some of it’s complex character. It’s probably worth mentioning that this bottle has been open in the cupboard for some time; I’ve heard that this can reduce the smoke a touch, and in the name of Science I shall, of course, have to replace this bottle with a fresh one in the near future! Master of Malt sells Lagavulin 16 Year Old for £43.95 at the time of writing.